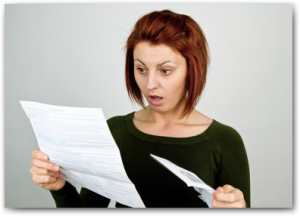 How would you feel if you went online to buy something – for example, a TV that’s listed at $495.00 – but when you get your order confirmation and credit card statement, you realize you got charged $535.00 for it instead? When you inquire about the price hike, you’re given the run-around, but eventually you’re told that there was only one TV available at that price, and someone else bought it a split second before your order got processed. So they filled your order with the same TV at the then-available best price, which was higher. And, they remind you, they have an “all sales are final” policy, so you’re stuck with the deal. You’d probably raise holy heck, wouldn’t you? Or you’d vow never to patronize that company again, right? So, you make your next online purchase from a different company… and the exact same thing happens! In fact, it happens every time you make an online purchase, adding up to significant lost dollars to you over time. Well, as it was revealed last week, this is exactly what’s happening to stock market investors every day – and it’s been going on for years. And it’s costing every-day investors billions of dollars. 60 Minutes just did an exposé on it, titled “Rigged,” just as a much-anticipated new book by Michael Lewis called Flash Boys blew the lid off this latest scandal. Read the 60 Minutes transcript here. To make “front-running” easy to understand, let’s go back to our example of buying a TV at an online store, priced at $495. It turns out the REAL reason you got charged a higher price for it is that there’s an underground “buyers’ club” with massive purchasing power that’s figured out how to use sophisticated technology to know you wanted to buy that $495 TV… buy it a tiny fraction of a second before you can, and then sell it to you for a higher price. It’s been going on for a long time – technology has just made it harder to know when you’re getting taken. Last summer, I tracked Wall Street scandals and scams during the month of August – a month I figured would be a slow news month given that a lot of traders were vacationing at their mansions in the Hamptons. But the sheer quantity and depth of the scandals that month surprised even me. 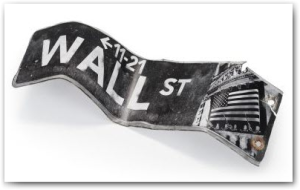 My summary, A Month of Scams and Scandals on Wall Street, makes an entertaining and eye-opening read. And, if you missed my article about the profound lesson on investing we can learn from the recent Oscar-nominated movie, The Wolf of Wall Street, I encourage you to check it out now. The movie is based on the autobiographical book by Jordan Belfort, which details his rise and fall on Wall Street. Really! You can’t make up stuff this good! How much more proof do we need to know that the fix is in on Wall Street? 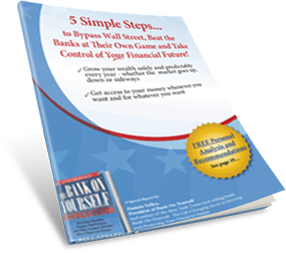 Are you ready to bypass Wall Street and grow your wealth safely and predictably every single year– even when the markets are crashing? You can join hundreds of thousands of people of all ages and incomes who use the Bank On Yourself method to do just that. Just request your FREE Analysis here (if you haven’t already). And then you can tell the banks and Wall Street to go take a hike! Yes, Wall Street is rigged!!! Has been forever. Great explanation of Wall Street and completely true! If you read Michael Lewis’ Flashboys, it seems the only honest dealer on Wall Street is the Royal Bank of Canada. Eye-opening stuff! But, yeah, Wall Street has a major problem here – or at least the SEC, who have a history of essentially managing public perception rather than actually fixing anything.